These vegan meatballs are juicy, tender and deliver the same kind of robust flavour and texture you would expect from a meatball. They are best savoured in the classic spaghetti and meatball dish, in various other sauces or on their own as an appetiser. It has been an amazing decade since I became vegan and meat is not something that I miss. In fact, I never quite liked the taste of it even before going vegan. That said, every once in a while for a little change in the meal scenery, I appreciate the comforting satiation delivered by meatier preparations. TVP meatless balls are not only quite alluring but they truly are a game changer. They don’t taste like meat; that’s for sure. 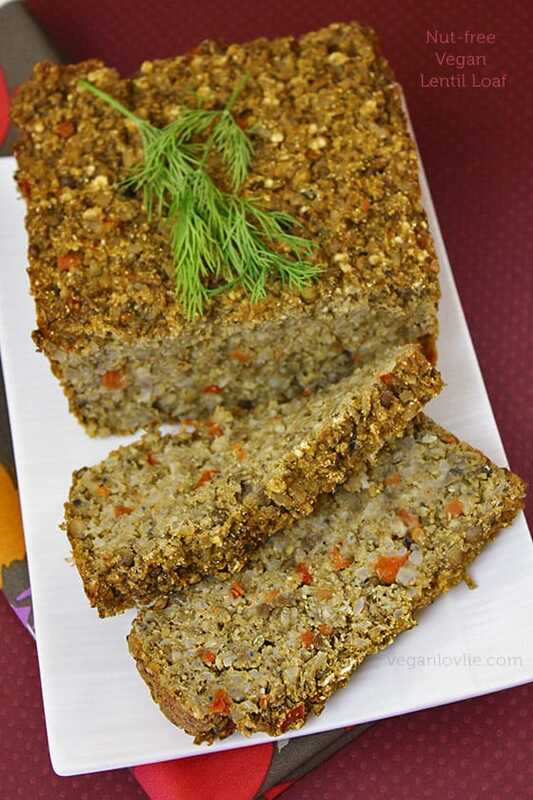 But those who would give their eyeteeth for meatier plant-based concoctions can expect to be smitten. 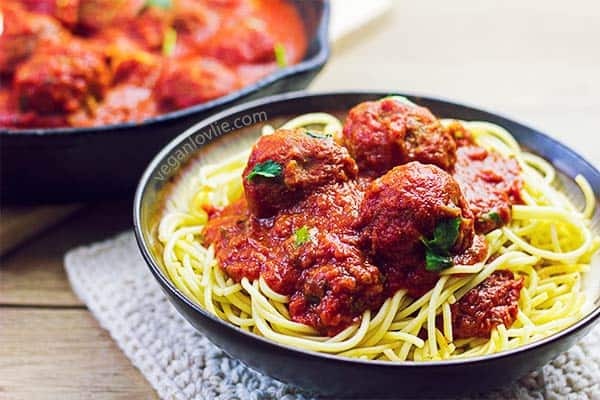 Whether you like meatballs on their own as an appetiser or incorporated as part of a meal, you will find a toothsome bite in this simple meatless meatballs recipe. They are juicy and tender with the robust flavour and texture appeal you would expect to find in a meatball. They definitely call for flavourful slow-simmered sauces – the classic spaghetti and meatballs dish make one of the best simple meals. I also tend to enjoy them in hearty soups or velvety curries. They make excellent fillings in soft wraps or crusty baguettes for a handy packed lunch. This is the second TVP (Textured Vegetable Protein) recipe in a row — on the blog and channel — simply because it was this very recipe that steered the creation of the vegan tuna mayo salad. While I did recommend using TVP in the form of chunks for the mock tuna recipe, the meatballs can be made with rehydrated granules as well. The chunks, however, do yield a nicer meatier texture. It just has that little extra bite to it that makes all the difference. 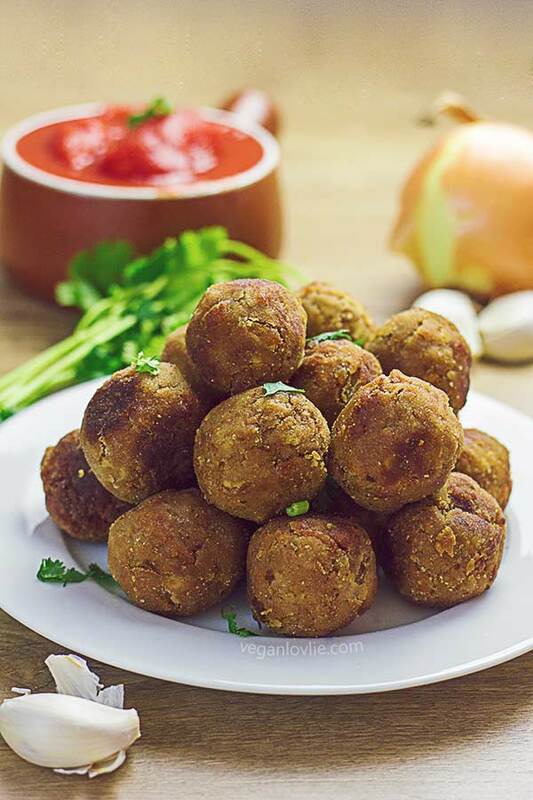 The combination of spices and seasonings is just right to make these meatless balls a treat on their own while keeping it subtle enough for them to be doused in your favourite sauces like the simple tomato sauce that I’ve shared below. The secret ingredient in these meatless balls is Marmite. Love it or hate it? In any case, Marmite’s very distinctive taste delivers the rich flavour and delightful aroma that give these meatless balls a deep profound savour. 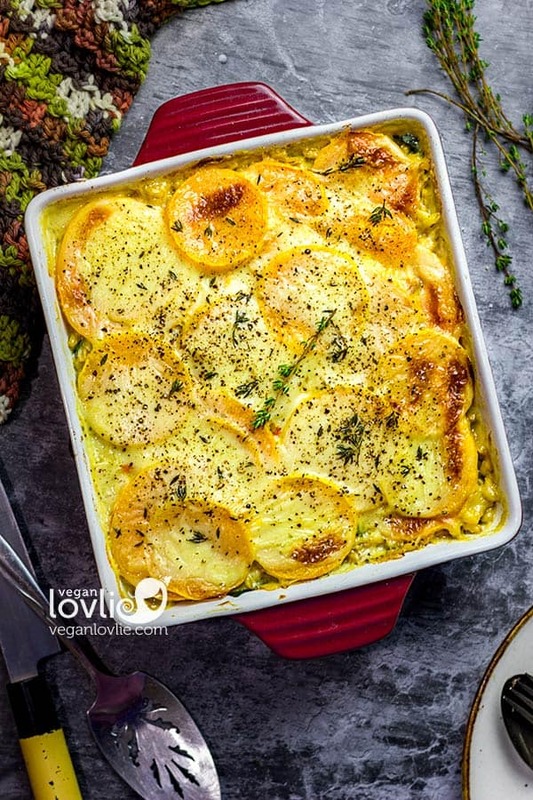 It is somewhat similar to nutritional yeast for the savoury cheesy kick it adds to dishes. If you belong to the Marmite haters club and have a jar of Marmite luring in the far corner of your fridge, then adding it to veggie meatballs and burgers will work wonders. You might even start to love this salty, yeasty, tasty, savoury spread that many (including myself) enjoy on toast or bread. These meatless balls can be made in advance and frozen for quick weekday dinners. They freeze well for up to 3 months. You can either freeze them right after the balls are formed or once you’ve pan-fried or baked them. If you have pre-cooked them, you would only need to reheat or just submerge them in sauces. Just make sure to freeze them separately so that they do not stick to one another. 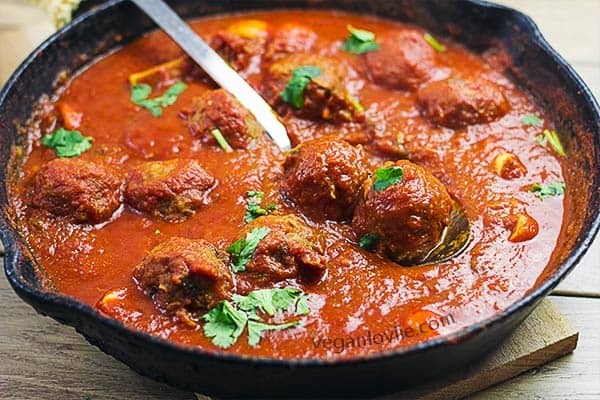 As usual, we have put up a short video of how to prepare these easy vegan meatballs. Cover the soya chunks with boiling water and let sit for about 10 minutes until rehydrated and soft. Meanwhile chop the onions and garlic. Once the TVP chunks are rehydrated, squeeze out the excess water from them. Place a small portion of the chunks in a jug for hand blending. Blitz them, in small batches, with a hand blender until they are flaky. Do not mash them completely. Repeat until all the chunks have been minced. You can also pulse them in a food processor. Set aside. In a skillet, sauté the onions and garlic in the coconut oil until translucent (about 5 minutes). Add the spices – paprika, cumin, coriander, turmeric and nutmeg. Saute for about 30 seconds. Next add in the minced TVP. Stir and saute for another 2 – 3 minutes. Note: If you are not using onions and garlic, add the minced TVP together with the spices at the same time. Toss and saute for about 3 minutes. Remove from heat. Place the mixture in a large mixing bowl and allow to cool. 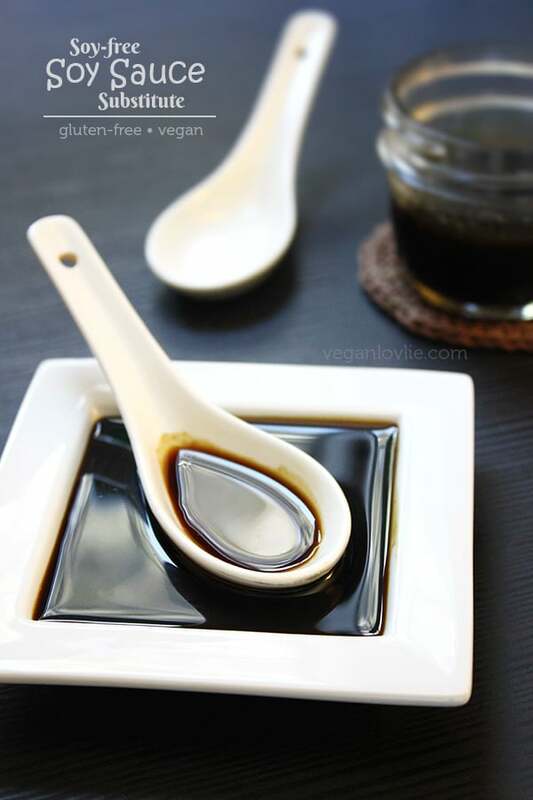 Dilute the Marmite in the soy sauce. Once the TVP mixture is cool enough to handle, add in the Marmite and soy sauce mixture, the potato starch and brown rice flour. Add salt to taste. Go in with your hand and mix thoroughly. Start to make balls that are a little smaller than a pingpong ball. The ball should stick and hold together well. If it feels dry and crumbly, add a little water and some more flour. Form the balls by applying a little bit of pressure. Dip the ball in some rice flour and coat it all over. Set aside. At this stage, you can freeze these balls for later use. Or you can proceed to pan frying or baking them. If you wish to bake them, just place them on a baking tray and spray with some cooking oil. Bake at 180 degrees Celsius (350 degrees Fahrenheit) for about 30 – 35 minutes in the oven. To pan fry them, heat about 2 tablespoons of coconut or cooking oil in a skillet on medium-high temperature. Wait for the oil to become hot, then drop in the balls. Do not overcrowd the pan. Fry in batches if you need to. Toss the balls on all sides every now and then for even frying. Once all sides are seared, reduce the heat slightly so that the inside of the balls is thoroughly cooked. Remove when lightly crispy on all sides. Drain on absorbent paper. Process all ingredients in a blender, except the oil. Heat the oil in a rather deep skillet. Add the sauce to the skillet and simmer partially covered for 20 – 25 minutes while stirring occasionally, until the liquid is reduced and the tomato sauce has changed to a deeper colour. Note: The sauce will tend to splatter, so preferably use a rather deep pan. I do personally prefer a skillet for quicker evaporation though, and in this case a lid helps to prevent splatters. Cover the skillet almost completely with a slight opening to let the steam escape. Add water to adjust the consistency of the sauce. Taste and adjust salt and pepper and maple syrup if tomatoes are too sour. 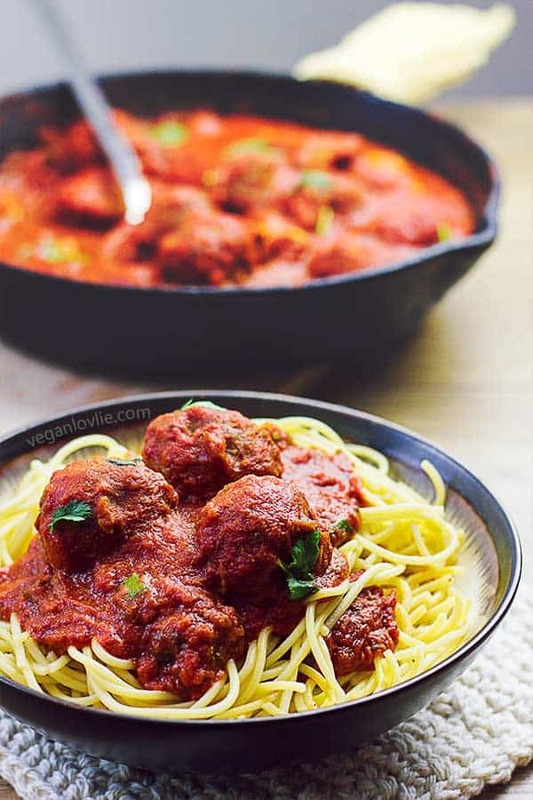 Drop about 12 – 15 of pan-fried or baked meatballs in the sauce. Add a little water if required and simmer for an additional 7 – 8 minutes. 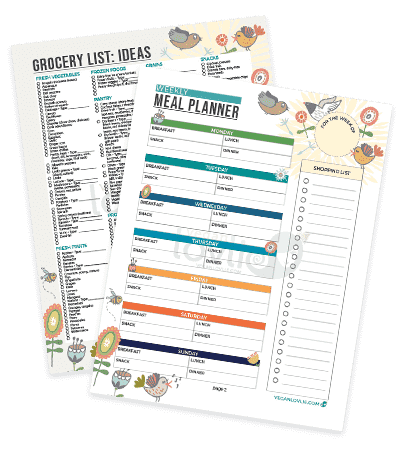 Serve over spaghetti or pasta of choice. Juicy, tender vegan meatballs that deliver the same kind of robust flavour and texture you would expect from a meatball. They are best savoured in the classic spaghetti and meatball dish, in various other sauces or on their own as an appetiser. In a skillet, sauté the onions and garlic in the coconut oil until translucent (about 5 minutes). Add the spices – paprika, cumin, coriander, turmeric and nutmeg. Saute for about 30 seconds. Next add in the minced TVP. Stir and saute for another 2 - 3 minutes. Process all ingredients in a blender, except the oil. Heat the oil in a rather deep skillet. Add the sauce to the skillet and simmer partially covered for 20 – 25 minutes while stirring occasionally, until the liquid is reduced and the tomato sauce has changed to a deeper colour. Note: The sauce will tend to splatter, so preferably use a rather deep pan. I do personally prefer a skillet for quicker evaporation though, and in this case a lid helps to prevent splatters. Cover the skillet almost completely with a slight opening to let the steam escape. Drop about 12 - 15 of pan-fried or baked meatballs in the sauce. Add a little water if required and simmer for an additional 7 - 8 minutes.